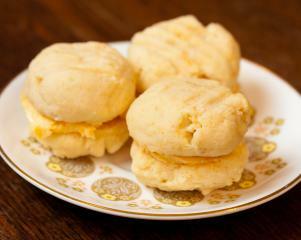 Share these biscuits with friends or try not to think about the amount of margarine that is in each one. Heat the oven to 180C / 360F. Begin by making the dough. Beat together the margarine, icing sugar and vanilla essence. Then gently mix in the flour and custard powder until it is combined. Make 32 golf ball sized pieces of the dough, placing them on a baking tray and pressing each one down with a fork. Bake in the oven for 25 minutes. While the biscuits are baking make the filling by beating the sugar, margarine and custard powder together until the mixture is smooth. Place in the fridge. When the biscuits are done remove them from the oven and leave them too cool. When they are cold sandwich them together with the filling. Store them in the refrigerator.